We’ve returned to planet Lattice after spending a wonderful time at Space Camp, Vidyard’s annual video marketing conference. We had a blast sharing how the video marketing strategy we follow at Lattice,networking with other marketers, getting inspired by Col. Hadfield and taking in all things Vidyard throughout the week. Oh, and we also returned with an extra piece of cute hardware. Many thanks to the entire Vidyard crew for throwing a great event and recognizing our hard work! Here’s a recap of our session in case you missed it. Video is an integral part of our overall marketing strategy. We believe that video helps bring our story to life. We create a variety of videos from explainers to funny spoofs to case studies and more to support our awareness and demand generation goals. And it’s technology that really powers our integrated video marketing strategy. 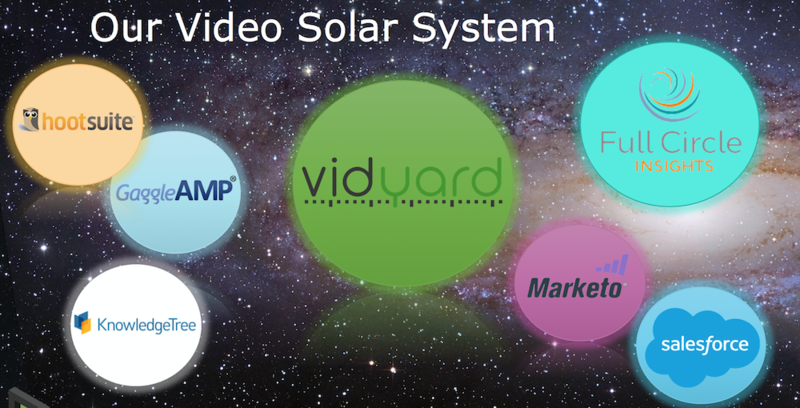 Here’s a look at our video solar system (see graphic above): We create our videos and upload them into Vidyard. This integrates with Marketo to let us score leads based on our audience’s engagement with our videos and create Interesting Moments that are synced over toSalesforce. We also use campaigns in Salesforce so that we can use FullCircle Insights to let us know which of our videos are influencing our pipeline and at what funnel stage. We take that information to tag the videos so that we can provide them to the sales team to share with customers and prospects through KnowledgeTree, our sales enablement tool. We then amplify our videos’ reach through social via GaggleAMP and HootSuite and through email viaMarketo. Overall we gauge the success of our video program on two dimensions – awareness and demand gen.
We’ve seen great results around awareness and engagement with our promo and explainer videos. Most recently our holiday video (Leads Actually) was featured on TechCrunch as a top example. We saw incredibly high engagement with the video with 80% watching over 60 seconds of the 1:10 video. The video also has over 2,200 organic views. Our Predictive Lead Scoring explainer video also ranks high on engagement. 65% of viewers make through 75% of the video. The video has also garnered over 12,000 views across all platforms. What’s more, video has really made an impact to our nurture program. Emails with videos have higher open rates, click through rates and clicked to open rates than emails without videos. More than 40% of our MQLs have engaged with our videos, which we are able to track through the Vidyard/Marketo integration. From this, we’ve learned that when a prospect watches customer testimonials and explainer videos, it is a great buying signal for our sales development team to follow up on. In addition, we put all of our videos in our sales enablement tool, KnowledgeTree, for sales to send to their prospects. Video assets are continually the most shared and most viewed content (e.g. viewed nearly 50% of the time). Most importantly, our videos have helped influence approximately 20% of our pipeline this year! What does that mean? Video played a part in one out of every five opportunities! For more information, check out our slides below.